Beauty and the beast rose RGB&WHITE LIGHT AND DIY AVAILABLE-This beauty and the beast rose kit includes red silk rose, RGB&WHITE led strip lights, 3 pieces fallen petals, glass dome, wooden base. The glass dome and the base are not glue fixed yet. You can DIY the led strip (strip 1.5m length; an led per 5cm) shape to shine romantic rose. 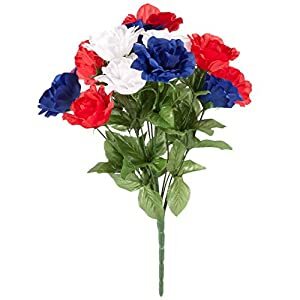 The rose in glass with lights on will shine as your love for your wife, your lover, your girlfriends, your child or families. 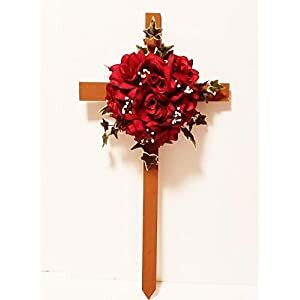 LOVE SYMBOL – Red silk roses, beautiful and elegant, as a symbol of forever love and appreciation, is also a symbol of best wishes. 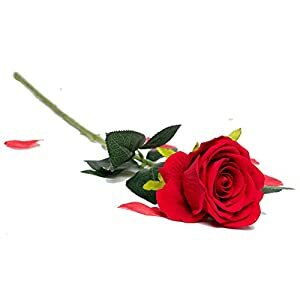 With non-discoloration, anti-oxidation, anti-moisture, anti-mildew, anti-pest characteristics, the Red Silk Rose will lasted forever without damaged. Keep the rose in the glass will lasted and shine as your enternal love. 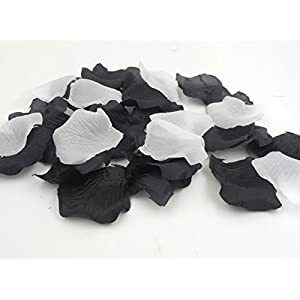 With 300 silk rose petals for free, you can use your creativity, DIY good looking scene graphics to help you create atmosphere. 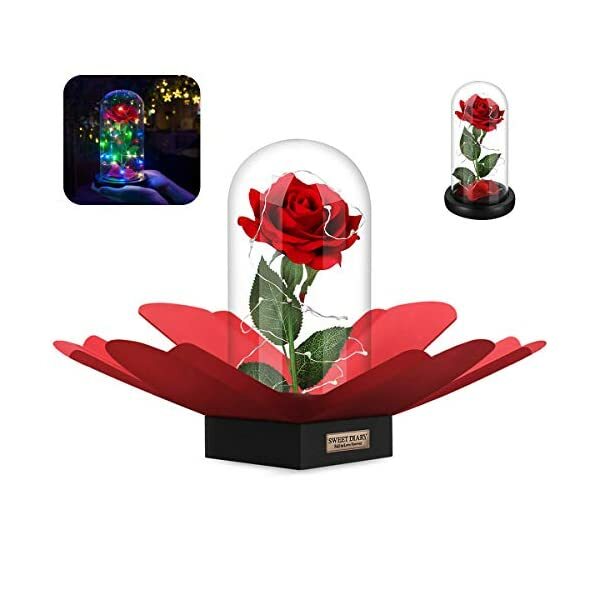 Beauty and the Beast Rose Kit consists of top quality glass dome, silk rose, fallen petals, wooden base, RGB led strip,3 AAA batteries. The battery compartment is at the bottomof the wooden base. BATTERYPOWERED–This rose light works with 3*AAA battery(included), no superfluous line to influence whole beauty. Just turn at the switch at the bottom, these small RGB leds will emit romantic light. The silk rose looks very beautiful and set stably within the glass dome. 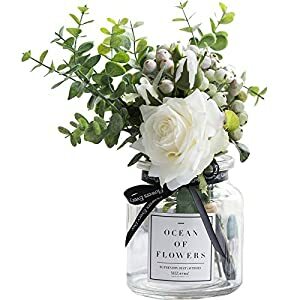 Romantic means to send this gift and you wish to have keep your love fresh and last perpetually. Red rose, beautiful and elegant, is not just as a symbol of perpetually love and appreciation but in addition a symbol of highest wishes. With non-discoloration, anti-oxidation, anti-moisture, anti-mildew,anti-pest characteristics. 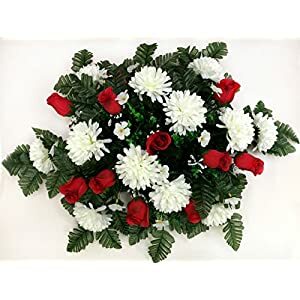 The rose kit not only can be utilized as home decor, but in addition will also be put at the desk in place of work, to ease the work fatigue and loosen up mood. 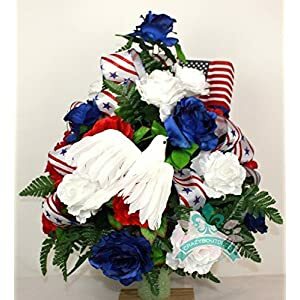 It’s unlike the fresh flowers at all times had to water and repair. The glass dome is placed at top a wooden base, encasing a single magical rose. 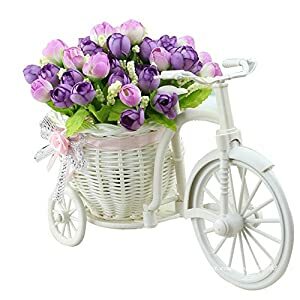 Wonderful and unique for engagement,Valentine’s Day, Christmas, birthday, proposal, wedding gift, home decor,wedding, Anniversary, Wedding Accessory and so forth. 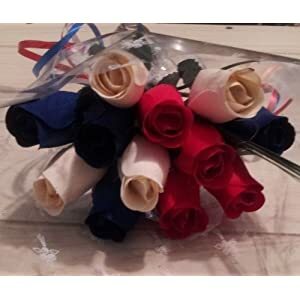 Beautiful rose with a card in a stupendous gift box, makes your gifts look warmer. The gift box created with high-quality paper materials, it is made with paper from well-managed forests. 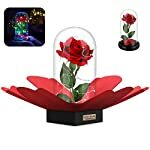 Beauty and the beast rose RGB&WHITE LIGHT AND DIY AVAILABLE-This beauty and the beast rose kit includes red silk rose, RGB&WHITE led strip lights, 3 pieces fallen petals, glass dome, wooden base. The glass dome and the base don’t seem to be glue fixed yet. You’ll be able to DIY the led strip (strip 1.5m length; an led per 5cm) shape to shine romantic rose. The rose in glass with lights on will shine as your love in your wife, your lover, your girlfriends, your child or families. ❤CLEAR ROSE GLASS DOME – Compare with other sellers, sweet diary’s silk rose glass dome is larger for better taking a look and more beautyful when the rose within the glass dome. Bright Glass Dome Diameter: 3.94″; Height 7.99″; Glass thickness 0.2″. 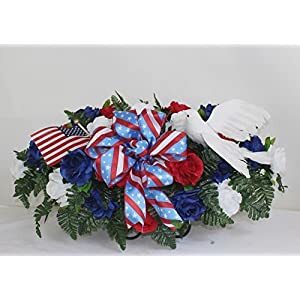 Packaged with a stupendous thick paper box, measures 15″x15″x25″, make your gift more gracefully and wonderful. ❤MONEY BACK GUARANTEE – Our Rose has been strictly tested. 100% Money Back Guarantee for those who don’t seem to be satisfied with it. Our goal is to offers you highest service. Don’t hesitate to contact us you probably have any problems.